began to design and manufacture of bucket wheel stacker reclaimer since 1966. So far, we have nearly 50 years history of design, manufacture and development of stacker and reclaimer. 2. Large quantity of design and manufacture of the product: Up to now r, DHHI has supplied about 730 sets of various stackers and reclaimers to domestic and foreign customers. 3. Completed types and specifications of equipment: DHHI has designed and manufactured nearly a hundred types and specifications of the bucket wheel stacker & reclaimer. According to the capability of the stacker and reclaimer, the capability is from 100t/h to 15000t/h. Slew radius is from 25 meters to 65 meters. According to the function of machine, there are boom type stacker, reclaimer and stacker & reclaimer, circular stockyard stacker and reclaimer, gate-type stacker and reclaimer, blending stacker, blending reclaimer, roller blending reclaimer, gate-type blending reclaimer, bridge type reclaimer and scraper reclaimer. According to the different type of tripper car, there are moving type single tripper, fixed type single tripper, the moving type double tripper, fixed type double tripper and flexible lifting type tripper and etc. According to the different luffing type, they can be divided into partial luffing hydraulic type, partial luffing steel rope winding type and the overall luffing hydraulic type and etc. 4. Cooperation with foreign famous manufacturing company: Since the reform and opening-up, DHHI has the most times of technical cooperation and communication with foreign industry. The cooperation is critical to improve the design and manufacture levels of DHHI, and to learn advanced technology and experience from overseas so as to improve the quality of products. The main cooperators are: MITSUI MIKE MACHINERY CO., LTD, MAN CO., LTD, MITSUBISHI CO., LTD, KNAUER CO., LTD, Cayard Co., LTD, ThyssenKrupp CO., LTD, Voestalpine Co., LTD and etc. Large amount of technical cooperation create the conditions of technology improvement and development of DHHI product. DHHI has learnt foreign advanced design and manufacturing technology through nearly 30 times the internal cooperation. 5. Lots of export products: export to Brazil, Venezuela, Argentina, Mozambique, Australia, Malaysia, India and other countries. Main users are VALE and BHP. Most of exported machines are large and ultra-large stacker and reclaimer. 6. Convenient transportation conditions: DHHI is located at the coast of the Bohai ocean. Products can be transported by road, rail, shipping. Especially for delivery of large equipments, it has advantageous geographical conditions. Large products can be entirely shipped, which will reduce the second time of the assembling on site and this will greatly improve the quality of the products. 7, has its own fabrication base and excellent manufacturing equipment: DHHI has five manufacturing bases in Dalian, totally taking up the area of 6 million square meters. High precision equipment HEANYCNT 200 type CNC boring machine, PF - 200 H75KW (IS) 315/250/250 x400 type CNC gantry boring and milling machine and other equipments improve the machining precision. High precision numerical control cutter blanking guarantees the welding quality of weld pieces. 8. Excellent design team and advanced design methodology: DHHI bucket wheel stacker and reclaimer design team consist of over 160 engineers. We have both old engineers with rich experience and young engineers seizing every minute who design a large number of advanced stackers and reclaimers each year. DHHI bucket wheel stacker reclaimer design use Auto CAD for the drawing design, and combine using 3D and 2D drawing. We also develop integrated design software for stacker and reclaimer, and we use the most advanced computer software I-DEAS, ANSYS Microstran V9 to proceed with strength and stiffness analysis in order to ensure the stiffness and strength of equipment and fully guarantee the quality of design. In addition, we also have 3D modeling and analysis software: SIEMENS NX, material flow simulation analysis software: DEM, dynamic simulation analysis software, ADAMS, and the belt conveyor calculation analysis software: Sidewinder. 9. Use technology standards: applying to different customer group needs, we can adopt international standards, European, Australian and Chinese standard for the design and manufacture of bucket wheel stacker and reclaimer so as to meet different design and manufacturing standards for different customer groups. Mainly the standards include JB/T 8849-2005, JB/T 4149-2010 boom type bucket wheel stacker and reclaimer technical conditions, ISO 5049/1: 1994 2. Mobile Equipment for Continuous Handling of Bulk Materials Part1: Rules for the design of Steel Structure, FEM SECTION II: 1997 and Australian standard AS4324.1-1995. 10. Strict trial-installation process: DHHI carry out trial-installation in the workshop as far as we can for bucket wheel stacker and reclaimer. Trial-installation process is with many sets of large gantry cranes so as to verify manufacturing precision and maximally guarantee the correctness of all parts of equipment when they arriving on site. 11. Capable of installation team: DHHI has its own installation team that can organize the design, manufacture, installation and commissioning work as one-stop services. We undertake turn-key project. 12. 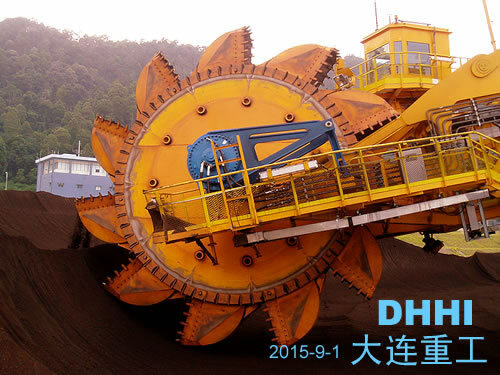 Highly qualified: DHHI is a backbone enterprise of equipment manufacturing industry in China with excellent qualification of integrity. ISO9001 quality management system, ISO10012 measurement management system and boom type bucket wheel stacker and reclaimer obtain local industrial products manufacturing warrant issued by People's Republic of China national administration of quality supervision and inspection bureau. DHHI has strong capital and technical. DHHI came into the market in Shenzhen stock exchange in 2012. Company is profitable for many years with excellent economic efficiency.